Since we moved into our townhouse in July we’ve been slowly working on projects around the house. We’ve known since we moved in that we wanted to showcase our race medals on one of the walls in our office. I’ve slowly been ordering pieces for our display, and we finally had time Saturday morning to hang everything up. Right now the wall is made up of three pieces. 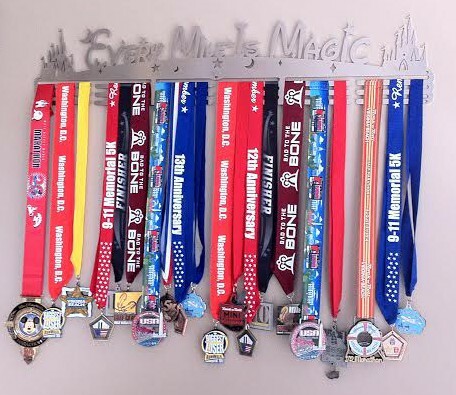 The medal hanger on the left, which currently has all of our runDisney medals except for Preston’s first marathon medal, is from Gone for a Run. Back in the spring, I won a gift certificate that Heather from Through Heather’s Looking Glass gaveaway on her blog, and I’d been holding onto it ever since. In between Preston’s six Dopey Challenge medals and my medals from the Disney World 10k and Half Marathon are our Disney buttons from our races, which I hung from a piece of ribbon. The top two buttons are from when Preston ran the Disney World Marathon in 2013 (which was his first marathon). The next two buttons are in celebration of my first half marathon, and the bottom button is the “I’m Celebrating” button that Preston wore after the Dopey Challenge. The medal hanger on the right is from Allied Medal Designs. Last month I came across a discount code, and since Preston and I had been eyeing the “Every Mile is Magic” one for awhile, I knew it was finally time for us to order it. Although they’re covered right now, we bought the display with three bars, so there’s plenty of room to add more medals from future races. 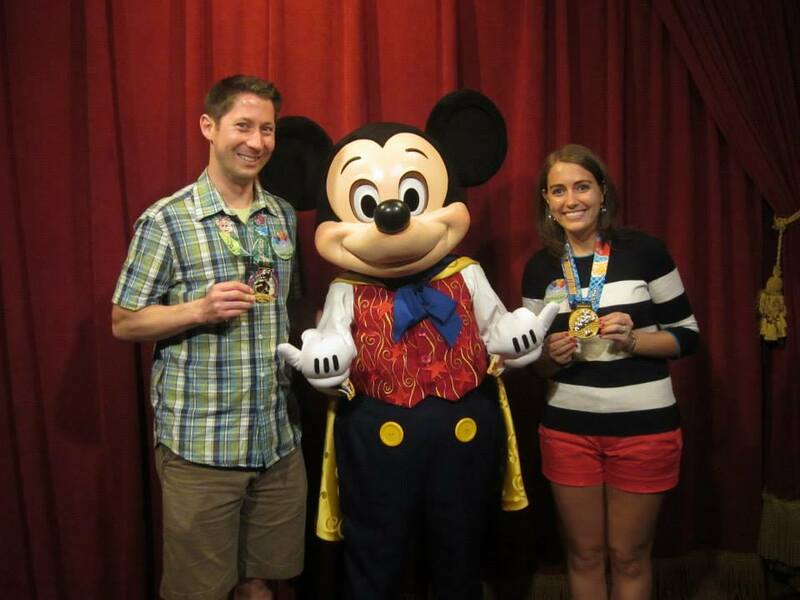 The photo in the middle is our favorite picture from this year’s Disney World Marathon Weekend. Preston is showing off his Dopey Challenge medal and I’m wearing my medal from my first half marathon. Back in August Groupon had a spectacular deal for Canvas on Demand. I’m so glad that we took advantage of the deal, as the picture looks fantastic blown up. I can’t wait to print and hang more pictures in the future. My next memorabilia project will be a race scrapbook. Right now all of our bibs are in a binder, and I want to work on transferring them into a scrapbook with other race photos. I foresee this being a great project to work on throughout the winter when its too cold and/or snowy to leave the house. QOTD: How do you display your race medals and other race memorabilia? 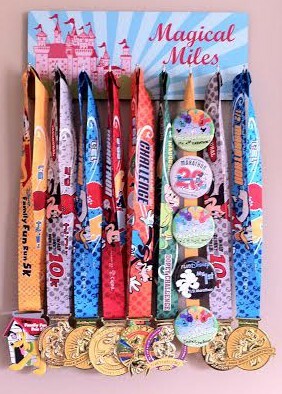 This entry was posted in Miscellaneous and tagged medal hanger, runDisney. Bookmark the permalink. I love your medal display and picture (turned out great). I bought a coat hanger fashioned out of horseshoes for my medal, but have not hung it up yet. Definitely a project for this fall/winter. Winter is always a great time for projects, especially for people like me who hate going outside and being cold. Love your display, you have so many medals!!! Right now I have a medal hanger from Gone for a Run too and have a bulletin board next to it where I have been pinning my bibs. I need to find a better way to display the bibs though, they kind of look clustered! Oh I LOVE your medal display Kathryn! The picture of you and Preston with Mickey completes it so well!!! Its the perfect picture, isn’t it? What a great display! I love seeing how others display their medals and yours looks awesome! Especially love the Mickey pic! I hate to admit that I don’t display my medals anywhere. They’re all shoved into a couple shoe boxes. Eeek! Maybe I should make that a priority sometime soon. I really like your displays and hangers. You guys have lots of medals. They were all in a drawer before we moved, and since we moved they were all in a box. It was finally time to proudly display them. Love your display and race scrapbook idea! I really need a medal hanger, as all my race bling is just laid out in display on my desk at home. They need to be hung for sure!!! There are so many ways to display medals, the possibilities are definitely endless. Oh this looks fabulous! I have all my medals displayed in my dressing room, although my husband thinks I should move them to another part of the house so they can be seen,,,haha. I love this! Way to go on earning all those medals! Such a beautiful display! I just started running and I got my first medal last month. It’s such an awesome feeling. I hope to build up the race memorabilia! You’ll never forget the experience of earning your first medal! Could you frame them and hang them in the stairway? I’m so glad that I remembered to keep the buttons. They are a perfect compliment to the medals.